The Mustangs celebrate after rallying to take the lead in the fifth inning. It took nine innings to decide the victor, but it actually felt like 78 years. When Oscar Galvez put a swing on the ball and it found the grass, the Jefferson Dragons walked off victorious to enjoy a moment that was a long time in the making. 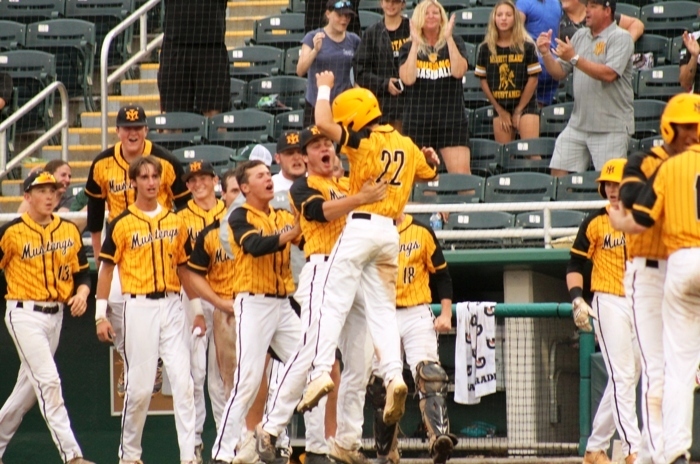 Connecting for an RBI single in the bottom of the ninth inning, Galvez pushed across the deciding run that gave the Jefferson Dragons a 6-5 victory over the Merritt Island Mustangs in Thursday’s Class 6A state championship, at Hammond Stadium in Fort Myers. It is Jefferson’s first state title in its 78-year history, since the school opened in 1940. 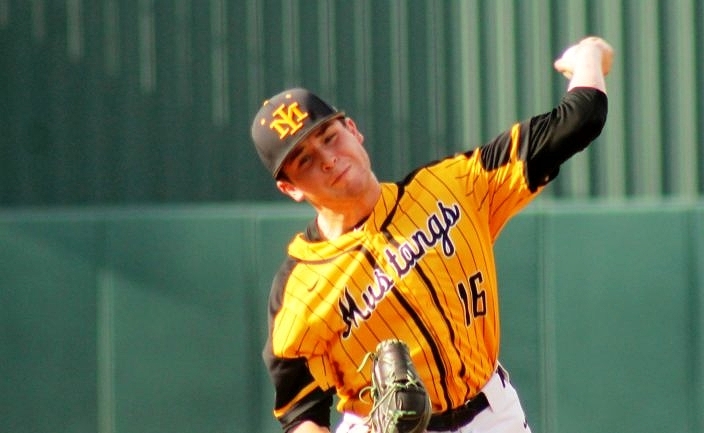 “It is heart-breaking, after you go nine innings and it is back-and-forth,” Mustangs manager Greg Plecki said. With things all knotted up in the ninth, Jefferson (22-8) strung some offense together to pave the way to victory. Jake Coleman walked and was replaced by Jaiden Duarte on the bases, who was then erased on a fielder’s choice that put Ty Evans on first base. Sal Vega lined a single to left and Galvez delivered the final dagger with a base hit to center that ended the battle and sparked the celebration. Jefferson did not allow Mustang starter Chase Victor to settle in, as the Dragons sent seven batters to the plate and took a 3-0 lead with their first swings in the bottom of the first inning. Robby Martin capitalized on a 2-0 offering and sent it drifting high over the left field fence for a solo home run that got his side out in front. Senior left-hander Chase Victor made the start, but did not factor in the decision. With momentum one their side, the Dragons kept it going to increase the pressure. Charlie Welch walked on four pitches, but was then erased as DeGusipe rolled into a fielder’s choice that erased the lead runner. Jaiden Duarte came in to run the bases for DeGusipe, Jake Coleman then walked, and both runners raced around the bases to score following a pair of defensive throwing errors. The Mustangs (24-7) got one back in the top of the third. Mason Denaburg deposited a base hit into shallow right field and just out of the reach of several pursuing defenders. 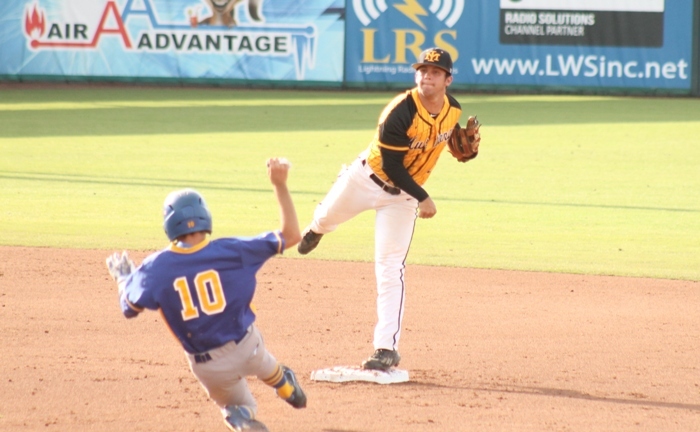 Victor then ripped a liner past third base and deep into the left field corner, allowing Denaburg to race all the way around the base for Merritt Island’s first run of the night. It took little time for the Dragons to seize the momentum back to their side of the field, as they immediately tallied another run in the bottom of the fourth. Sal Vega plunked a base hit into right field and Jack Rodriguez walked to put some ducks on the pond. Andrew Mathis then sent a liner shooting into left field to send Vega around third and across the plate. The Mustangs attempt to turn a double play in the second inning. With things beginning to get later into the action, Merritt Island amped up the pressure to turn things into a shootout. Nick Avdellas drove a shot deep to left just out of reach of the diving outfielder, which sent him racing around the bases for a triple in the fifth. Denaburg then sent a roller up the middle to easily drive Avdellas in to make it a 4-2 game and cut the deficit in half. With their fans and dugout ignited, the Mustangs seized their moment and grabbed their first lead of the night. Victor walked to provide another base runner and Kyle Dentmon singled to left to knock in Ryan Taylor. Ricardo Diaz followed with a shot to center that drove in a pair to give his club a 5-4 edge. It was then Jefferson’s turn at the top of the seesaw, as they returned fire to even things back up in the bottom of the fifth. Ty Evans reached on an error, advanced on a passed ball and then made it a 5-5 contest when Oscar Galvez rolled an RBI single past third. Unable to add that final crucial run that would have changed the outcome, the Mustangs were left to reflect on what could have been. The team hoped to bring a renewed energy to a program that last enjoyed a state title before most of the current players were even born.